Casino exclusion programs are intended to prevent or limit gambling-related harm. 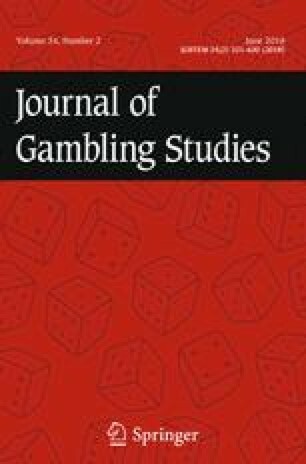 Although previous research showed that self-exclusion is associated with reduced gambling, it remains unknown whether self- and forced excluded subjects show different patterns of gambling behavior and if exclusion from casino gambling affects all gambling activities. The present study retrospectively investigated (1) the role of voluntariness of exclusion for the first time, and (2) general gambling behavior of excluded individuals before and after exclusion. A total of N = 215 casino excluders (self-excluders: n = 187, forced excluders: n = 28) completed an online survey or a face-to-face interview up to 8 years after enrollment. Self- and forced excluders showed similar rates of abstinence (self-excluders: 19.3%, forced excluders: 28.6%) and reduction (self-excluders: 67.4%, forced excluders: 60.7%), even though forced excluders reported a significantly greater initial gambling intensity compared to self-excluders (e.g., pre-exclusion gambling time; self-excluders: 3.2 days/week, forced excluders: 4.3 days/week). Overall, results indicated that 20.5% of excluders stopped all gambling activities and another 66.5% reduced their gambling. Those who continued gambling significantly reduced this behavior in every segment, except for gambling halls. Findings indicate that self- and forced exclusion are associated with similarly reduced gambling behavior, even in non-excluded segments. However, unchanged gambling in gambling halls emphasizes the importance to implement consistent exclusion programs over all gambling segments. This research was funded in part by an unrestricted research donation by the Federal Association of German Casinos (BupriS) to the Technical University Dresden. Roxana Kotter and Anja Kräplin declare that they have no further conflict of interest. Gerhard Bühringer has received unrestricted research grants from the Bavarian State Ministry of Finance (regulatory authority for and operator of the state gambling monopoly), via the Bavarian State Ministry of the Environment and Public Health, the German Federal Ministry of Economics and Technology (regulatory authority for the commercial gaming industry), and from public and private gambling providers. Bellringer, M., Coombes, R., Pulford, J., & Abbott, M. (2010). Formative investigation into the effectiveness of gambling venue exclusion processes in New Zealand. Wellington: Ministry of Health. https://www.health.govt.nz/system/files/documents/pages/problem-gambling-formative-investigation-report-final.pdf. Accessed June 6, 2017. Cohen, I. M., McCormick, A. V., & Corrado, R. R. (2011). BCLC’s voluntary self-exclusion program: Perceptions and experiences of a sample of program participants. https://corporate.bclc.com/content/dam/bclc/corporate/documents/corporate-reports/VSE-Longitudinal-Study.pdf. Accessed June 6, 2017. Lischer, S. (2016). The beneficial impact of self-exclusion. Conference contribution presented at the 11th European Conference on Gambling Studies and Policy Issues. Lisbon, Portugal. http://www.easg.org/media/file/lisbon2016/presentations/16-09-2016/Par%204/Suzanne_Lischer.pdf. Accessed June 6, 2017. O’Neil, M., Whetton, S., Dolman, B., Herbert, M., Giannopolous, V., O’Neil, D., et al. (2003). Evaluation of self-exclusion programs and harm minimisation measures. Report A. Melbourne: Gambling Research Panel. https://www.adelaide.edu.au/saces/docs/publications-reports/completereportselfexclusiona.pdf. Accessed June 6, 2017. Responsible Gambling Council. (2008). From enforcement to assistance: Evolving best practices in self-exclusion. Discussion paper by the Responsible Gambling Council. http://www.responsiblegambling.org/docs/default-source/research-reports/from-enforcement-to-assistance-evolving-best-practices-in-self-exclusion.pdf. Accessed July 25, 2017. Seah, A. (2016). Gambling Social Safeguards: Singapore’s Experience. Conference contribution presented at the 11th Europrean conference on gambling studies and policy issues. Lisbon, Portugal. http://www.easg.org/media/file/lisbon2016/presentations/15-09-2016/Par%202/Audrey_Seah.pdf. Accessed October 11, 2017. Steinberg, M. A. (2008). Ongoing evaluation of a self-exclusion program. Conference contribution presented at the 22nd National Conference on Problem Gambling. Long Beach, California, USA. http://www.ccpg.org/research/EvalCasino2007.pdf. Accessed July 25, 2017. Verlik, K. (2008). Casino and Racing Entertainment Centre voluntary self-exclusion program evaluation. Conference contribution presented at the 7th European Conference on Gambling Studies and Policy Issues. Nova Gorica, Slovenia. http://www.easg.org/media/file/conferences/novagorica2008/thursday/1400-ses3/verlik_kent.pdf. Accessed July 25, 2017. Williams, R. J., West, B. L., & Simpson, R. I. (2012). Prevention of problem gambling: A comprehensive review of the evidence, and identified best practices. Report prepared for the Ontario Problem Gambling Research Centre and the Ontario Ministry of Health and Long Term Care. https://www.uleth.ca/dspace/bitstream/handle/10133/3121/2012-PREVENTION-OPGRC.pdf. Accessed July 25, 2017.